Glam Polish released a Seuss-tacular collection not too long ago, and I have three of the polishes from that collection to show you. I'm a big fan of Dr Seuss, but let me tell you, they are some long rhymey books to be reading toa five year old after a brain numbing day at work. I swear that sometimes One fish, two fish, red fish, blue fish grows extra pages while I'm reading it, it takes forever to read. Blue Goo - Neon Hot Pink squares and micro glitter, neon green squares, lavender squares, neon blue micro glitter, white squares and rectangles in a light blue base. Drink Pink Ink -- Neon Hot Pink squares and butterflies, turquoise dots, blue hex, ocean and fuchsia micro glitter in a dark pink base. Curse you One fish, two fish, red fish, blue fish! Muddle Puddle - Neon blue hex, neon hot pink hex & square, neon green hex and micro glitter in a green base. Baaa haa haa - Fox in Socks, what's not to love about that last sentence. Formula wise, I had no issues with these polishes at all, even the ones with the super dooper sized hexes. 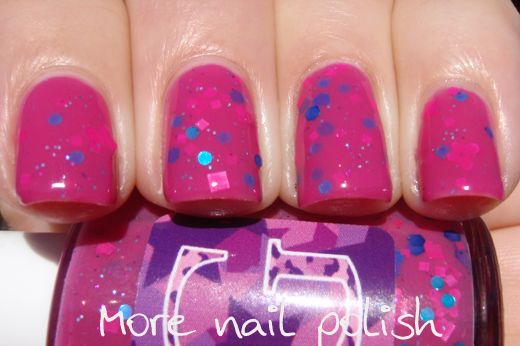 Those glitters are large on the nail and sit very flat, but top coat can smooth away the edges quite well. There are no curling glitters and the milky bases are squishy looking and bright. All my swatches show three coats with Seche Vite on top. I only have one more thing to say about them - Gorgeous! All three of these are stunning! I love Blue Goo! I seem to be developing a real weakness for any teal jelly with glitter in it...... and new ones are being released as fast as I can buy them, lol! Muddle Puddle come to meeeeeeeee! I have been on a real green kick lately.